Commitment: Two 1-hour practice/games each week. 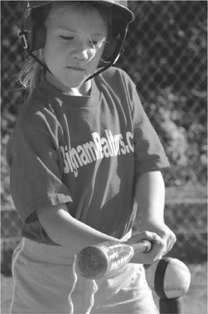 MGSA's T-ball league is for pre-Kinders and Kindergarteners. It is a very basic instructional league with an emphasis on hitting off a tee, catching the ball, throwing and, frankly, running the right direction. The T-ball league plays on Thursday nights at Bennett Family Park and Sunday early afternoons at Legacy Fields (at Minnetonka High School). During their one hour, they practice and play a short game. • All batters will hit off of a tee. • There will be no strikeouts. The batter will swing until the ball is hit into fair territory. • A ball that is hit and goes less than 5 feet in front of the plate in fair territory is considered a foul ball. • The home team will supply the tee and game ball. • The game ball will be a soft baseball or softball (nine-inch circumference). • There will be one pitcher at or near the pitcher’s rubber. The pitcher may not leave the rubber area until the ball is hit. • Runners may not advance further than the base to which they were approaching once a fielder has touched a batted ball. • Baserunners may not tag and advance on a fly ball. • The distance between bases is 50 feet. • One coach is allowed in the outfield to provide instruction to fielders. Play may not be stopped for instructional purposes. • All available players may play in the field at one time, with no more than 6 players in the infield; the rest of the players must be in the outfield, at least 20 feet behind the first-second and second-third baselines. • Bat your entire line up. • Each team is responsible for cleaning up their dugout and bleacher areas after the game.